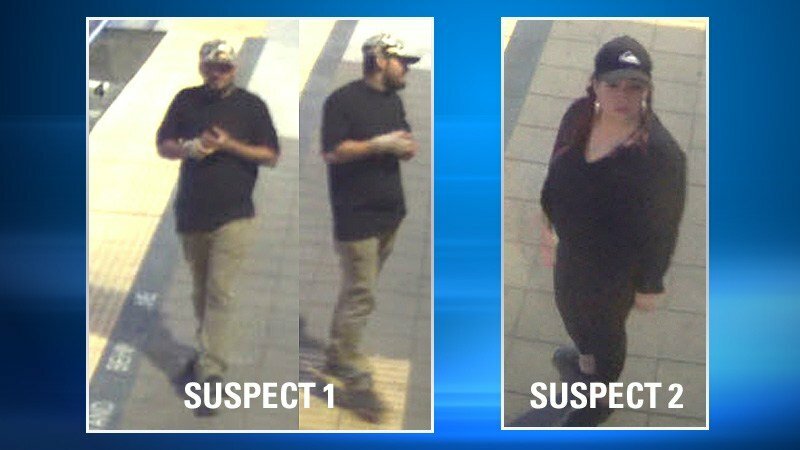 SAN DIEGO (NEWS 8) - San Diego County Crime Stoppers along with San Diego police investigators are asking for the public's assistance in identifying and locating two suspects who violently assaulted and robbed an adult male while he was sitting at the MTS trolley platform located 1910 Harbor Drive on April. Video footage shows the 19-year-old victim was sitting on a bench on April 18 between 7:30 p.m. and 8 p.m. at trolley platform looking at his cell phone when a female and male suspect walked onto the platform and began casing the victim. The male suspect walked toward the victim and without provocation or warning, punched the victim once in the face. The male suspect then grabbed the victim and threw him on the ground. While the victim was on the ground, the female suspect calmly walks over to the bench and takes the victim's backpack. Both suspects were last seen walking northbound on Cesar Chavez Parkway. The male suspect was described as White or Hispanic, early to late 20's, approximately 5'8" to 6'0" tall, medium build, wearing tan pants, black t-shirt, camouflage baseball style hat (possibly with a Peanuts cartoon - "Snoopy" character on it). His right hand was possibly wrapped in some type of bandage. The female suspect was described as White or Hispanic, early to late 20's, approximately 5'4" to 5'6" tall, heavy build, wearing black leggings, black shirt and black Quicksilver brand baseball style hat. Anyone with information on the identity or location of the suspects is asked to call the SDPD's Central Division at (619) 744-9527 or the Crime Stoppers anonymous tip line at (888) 580-8477. Crime Stoppers is offering up to a $1,000 reward to anyone with information that leads to an arrest in this case. Visit the Crime Stoppers website at www.sdcrimestoppers.org for more information on how to send anonymous web and mobile app tips.